The four regional municipalities surrounding the City of Toronto – Halton, Peel, York and Durham – have seen spectacular growth in the past fifty years. Until the 1960s, these former counties were primarily rural townships surrounding well established small towns. However, development spilled past the boundaries of Metropolitan Toronto and managing that growth became the great challenge of the Province of Ontario, which created the regional municipalities in response. With the bulk of its growth initially built in service of Toronto’s commuting traffic, the new cities of Mississauga, Vaughan, Markham and Pickering began as bedroom communities, and the bulk of their residential development was single family homes. The imposition of rent control in the 1970s may have had an influence, as communities with larger, established centres like Mississauga and Oshawa have a higher apartment to person ratio than newer centres like Vaughan, Markham or Richmond Hill. The smaller markets of the outer-GTA, combined with high local incomes, have kept average rents high and vacancy rates low. In some areas, demand is severely repressed thanks to low supply. In recent years, many of the outer-GTA municipalities, including Oakville, Vaughan and Markham, are regretting their history of low-density developments and have considered intensification as a means of dealing with congestion and continued population growth. This suggests that the supply of high-rise apartment stock is going to increase in the next fifteen years. Currently, markets throughout the outer belt of the Greater Toronto Area are tightly traded, limiting buying opportunities and the chances for repositioning. However, demand still makes these good areas to buy. The biggest returns; however, may come from new construction as the cities around Toronto get serious about intensification. The City of Oshawa is a small but well-established urban centre to the east of the amalgamated City of Toronto, boasting a population of over 150,000. Established and initially growing as an economic engine in its own right – thanks especially to the General Motors plant that anchored the city for years – Oshawa saw a substantial amount of its development before the 1950s and maintained its local identity long after the neighbouring towns of Pickering and Ajax became bedroom communities. Oshawa encountered an identity crisis when its manufacturing base shrank in the face of American competition. Since the early 1990s, the city has had to reinvent itself, increasing its service and education sector and becoming more of a commuter-based city. Oshawa’s earlier development has made it the largest market for apartments between Toronto and Kingston, with almost as high a concentration as Scarborough. 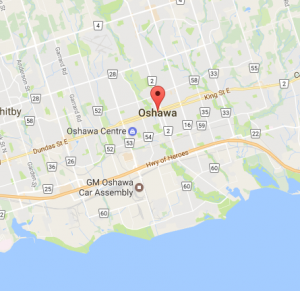 Oshawa’s apartment market does have areas of opportunity and areas where investors should tread cautiously, and it is important to be aware of which side of the highway potential deals are on. South of Highway 401, the economic demographics do indicate risky investments. Oshawa is a well-established city with a strong downtown and strengthening economy. This urban centre is increasing its transportation connections with the City of Toronto, with improved and extended commuter rail and new highway construction. As the Greater Toronto Area grows, prospective renters will be attracted to this city, with its mixed neighbourhoods and affordable apartment stock. One should not expect Oshawa’s vacancy rates to remain high, nor average rents to remain low for long. Look for developing bright spots in the downtown and the north end of the city as investment and growth continue. A new university campus and a lack of student housing offers opportunities for buying, repurposing and building. The volatile automobile sector will continue to influence the local market. INTERESTED IN NEW APARTMENT CONSTRUCTION IN THIS REGION? FILL OUT THE FORM BELOW TO REQUEST THE RECENT TRANSACTIONS.